The Book Thief is a 2013 World War II war drama film directed by Brian Percival and starring Geoffrey Rush, Emily Watson, and Sophie Nélisse. The film is based on the 2005 novel of the same name by Markus Zusak and adapted by Michael Petroni. The film is about a young girl living with her adoptive German family during the Nazi era. Taught to read by her kind-hearted foster father, the girl begins "borrowing" books and sharing them with the Jewish refugee being sheltered by her foster parents in their home. The film features a musical score by Oscar-winning composer John Williams. The Book Thief premiered at the Mill Valley Film Festival on October 3, 2013, and was released for general distribution in the United States on November 8, 2013. The film received mixed reviews upon its theatrical release with some reviewers praising its "fresher perspective on the war" and its focus on the "consistent thread of humanity" in the story, with other critics faulting the film's "wishful narrative". With a budget of $19 million, the film was successful at the box office, earning over $76 million. The Book Thief received Academy Award, Golden Globe and BAFTA nominations for its score. For her performance in the film, Sophie Nélisse won the Hollywood Film Festival Spotlight Award, the Satellite Newcomer Award, and the Phoenix Film Critics Society Award for Best Performance by a Youth in a Lead or Supporting Role – Female. The film was released on Blu-ray and DVD on March 11, 2014. In February 1938, a male voice, representing Death itself, tells about how the young Liesel Meminger has piqued his interest. In one of the opening scenes, twelve-year-old Liesel is traveling with her mother and younger brother on a train. On the way, her brother dies and is buried next to the tracks. Liesel steals her first book, titled The Grave Digger's Handbook, when it falls out of the gravedigger's pocket. Liesel is then brought to her new home in Munich, where she meets her new foster parents Rosa Hubermann and Hans Hubermann. Rudy Steiner, a boy who lives next door, accompanies her on her first day of school. When the teacher asks Liesel to write her name on the chalkboard, she is only able to write three Xs, revealing to her classmates that she is unable to write. She is taunted by her schoolmates who chant "dummkopf" ("dunce") at her. One of the boys, Franz Deutscher, challenges her to read just one word to which Liesel responds by beating him up. She impresses Rudy, and they become fast friends. When Hans, her foster father, realizes that Liesel cannot read, he begins to teach her, using the book that she took from the graveside, and a giant chalkboard. Liesel becomes captivated with reading anything she can. Liesel and Rudy become members of the Hitler Youth movement. While at a Nazi book burning ceremony, Liesel and Rudy are harassed into throwing books onto the bonfire by Franz, but Liesel is upset to see the books being burned. When the bonfire ends and everyone leaves, Liesel is still there and she grabs a book that has been only singed. She is seen by Ilsa Hermann, wife of the burgermeister (mayor). When Rosa asks Liesel to take the laundry to the mayor's spacious, gated house, she realizes that the woman who saw her taking the book is the mayor's wife. Instead, Ilsa takes her into their library and tells Liesel she can come by anytime and read as much as she'd like. One day Liesel is found reading by the mayor who not only puts a stop to her visits but dismisses Rosa as their laundress. During Kristallnacht, Max Vandenburg and his mother, who are Jewish, are told by a friend that only one of them can escape, and Max's mother forces him to go. Max's father had saved Hans' life in World War I, and hence he goes to the Hubermanns' house where Rosa and Hans give him shelter. Max initially stays in Liesel's room while recovering from his trip, and they begin to become friends over their mutual hatred of Hitler. World War II begins, initially making most of the children in Liesel's neighborhood very happy. Max is moved to the basement so that he can move around more, but it is cold and Max becomes dangerously ill. Liesel helps Max recover by reading to him books "borrowed" from the mayor's library with every spare moment. One day while "borrowing" a book from the mayor's home, Liesel is followed by Rudy. He discovers the secret of Max, whose name he reads on a journal Max gave to Liesel for Christmas. Rudy guesses that her family is hiding someone, and he swears to never tell anyone. Franz overhears Rudy's last words of keeping it a secret and violently pushes Rudy to reveal the secret. Rudy throws the journal into the river to keep it away from Franz. After Franz leaves, Rudy plunges into the icy river to rescue the journal, and Liesel realizes that she can truly trust him. Soon, a local party member comes by to check the Hubermanns' basement, and they have to hide Max. While working, Hans sees a neighbor and friend named Lehman being taken away by the police because he is a Jew. Hans tries to intervene, telling the officer that Lehman is a good man, but Hans's name is taken by the soldiers and he is thrown to the ground. Hans realizes what a mistake he has made, since this has made his family visible. He tells the family, and Max realises he must leave in order to protect them. Hans then receives a telegram that he has been conscripted into the army and must leave immediately. On the way home from school, Liesel believes she has seen Max in a line of Jews being forcibly marched through town, and she begins screaming his name, running through the line. She is thrown to the sidewalk twice by German soldiers and finally gives up when Rosa picks her up and takes her home. Hans returns home after being injured, and the family is reunited only for a short time. One night the city is bombed by accident, and the air raid sirens fail to go off. Hans, Rosa, and Rudy's family are killed in the blast. Liesel was spared from the bombing because she fell asleep in the basement while writing in the journal given to her by Max. She sees her foster family on the ground, dead, she cries and hugs them. Neighbors bring Rudy out of his house, barely alive. He begins to tell Liesel that he loves her, but he dies before he can finish the sentence. During this scene, Death is heard speaking again about how he received the souls of the dead. Liesel passes out, and one of the soldiers carries her to a stretcher. When she wakes up, she sees a book among the rubble and picks it up. She then sees the mayor and Ilsa drive up. With Ilsa being the only friend she has left, Liesel runs up to her and hugs her. Two years later, after Germany has fallen to the United States and its allied counties, nineteen-year-old Liesel is working in the tailor shop owned by Rudy's late father when Max suddenly enters. Overjoyed by his survival and return, she runs to hug him. The final scene is Death speaking again about Liesel's life and her death at the age of 90, mentioning her husband, three children, and grandchildren, as we look over her modern day Manhattan Upper East Side apartment with pictures of her past and a portrait of her elderly self, upon which the camera lingers. The narrator does not state whom she had married but implies that she became a renowned writer. Left to right: book author Markus Zusak, stars Geoffrey Rush and Sophie Nélisse, director Brian Percival, interviewed about The Book Thief by Selig Film News in 2013. Sophie Nélisse as Liesel Meminger, the titular "book thief"
A search for an actress to play the eponymous book thief, Liesel Meminger, occurred across the world. On February 4, 2013, it was announced that Canadian actress Sophie Nélisse was cast in the role and that Australian actor Geoffrey Rush and English actress Emily Watson would be playing Meminger's foster parents. Principal photography began in early March 2013 at Babelsberg Studio in Potsdam-Babelsberg, Germany. The first trailer was released on August 21, with the Bastille song "Haunt" as the music. Markus Zusak, Australian author of the best-selling, award-winning book on which the film is based, confirmed on his blog that the film would be narrated by the character of "Death", as was the novel. After some speculation that Death might be voiced by the anonymous American actor who was used in the official trailer, it was announced that English actor Roger Allam of Game of Thrones would portray Death in the film. The music for the film was composed by John Williams, and the soundtrack album containing the score was released by Sony Classical. The album was released in the United States on November 19, 2013. It was nominated for an Oscar, BAFTA and Golden Globe for Best Original Score. It won Best Instrumental Album at the 57th Grammy Awards. The Book Thief marked the first time since 2005 that Williams had scored a film not directed by Steven Spielberg. Originally scheduled for January 17, 2014, The Book Thief's limited theatrical release was moved forward to November 8, 2013, due to the fact that it was finished ahead of schedule and in order to compete in the 2013–14 award season. It premiered at the Mill Valley Film Festival on October 3, 2013, and was screened at the Savannah Film Festival on October 29, 2013. It expanded to a wide release on November 27, 2013. 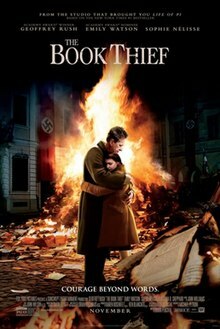 The Book Thief received mixed reviews from critics. Review aggregation website Rotten Tomatoes gives the film a score of 46%, based on 134 reviews, with an average score of 5.6/10. The site's consensus states, "A bit too safe in its handling of its Nazi Germany setting, The Book Thief counters its constraints with a respectful tone and strong performances." On Metacritic, the film has a score of 53 out of 100, based on 31 critics, indicating "mixed or average reviews". The Book Thief weaves a consistent thread of humanity through its narrative via the commonality of Death, storytelling and the concept of free will. The disturbing sight of children in Hitler Youth uniforms and Allied blanket bombing, when shown through the innocence of a child, humanises the German generation just living their lives without the hindsight of history. A blurring of vision due to tears is to be expected, but that effect is delivered with respect and dignity to the audience. In his review following the Mill Valley Film Festival, Dennis Harvey at Variety magazine wrote, "Rush generously provides the movie's primary warmth and humor; Watson is pitch-perfect as a seemingly humorless scold with a well-buried soft side." Harvey also praised the film's cinematography and film score, noting that "impeccable design contributions are highlighted by Florian Ballhaus'[s] somber but handsome widescreen lensing and an excellent score by John Williams that reps his first feature work for a director other than Steven Spielberg in years." With incredible acting, a gripping story and fantastic direction, The Book Thief is a heart-warming yet chilling tale, which will nestle in your mind long after the credits finish rolling. Stephanie Merry of The Washington Post was less impressed with the film, giving it two and half out of four stars. Merry felt that the film "has its moments of brilliance, thanks in large part to an adept cast" but that the film ultimately shows the difficulties of bringing a successful novel to the screen. In his review for the Los Angeles Times, Robert Abele was also unimpressed, describing the film as "just another tasteful, staid Hollywoodization of terribleness, in which a catastrophic time acts as a convenient backdrop for a wishful narrative rather than the springboard for an honest one". The Book Thief was released on Blu-ray and DVD on March 11, 2014. ^ "John Williams to Score 'The Book Thief'". Film Music Reporter. August 6, 2013. Retrieved August 6, 2013. ^ "The Book Thief (12A)". 20th Century Fox. British Board of Film Classification. Retrieved November 27, 2013. ^ a b "The Book Thief". The Numbers. January 5, 2014. Retrieved January 6, 2014. ^ a b "The Book Thief". Box Office Mojo. February 6, 2014. Retrieved February 10, 2014. ^ a b c d Roche, Mairéad (February 28, 2014). "In Review: The Book Thief". New Empress Magazine. Retrieved March 27, 2014. ^ a b Abele, Robert (November 8, 2013). "Review: 'The Book Thief' robs the truth from an evil time". Los Angeles Times. Retrieved February 23, 2014. ^ a b "The Book Thief (2013): Releases". AllMovie. Retrieved March 27, 2014. ^ Kit, Borys (February 4, 2013). "Geoffrey Rush and Emily Watson to Star in 'The Book Thief' Movie (Exclusive)". The Hollywood Reporter. Retrieved August 6, 2013. ^ Roxborough, Scott (March 11, 2013). "'The Book Thief' Begins Shooting in Germany". The Hollywood Reporter. Retrieved August 6, 2013. ^ "'The Book Thief' Soundtrack Details - Film Music Reporter". filmmusicreporter.com. ^ "The Book Thief". rottentomatoes.com. November 8, 2013. ^ "The Book Thief". Metacritic. ^ a b Harvey, Dennis (October 4, 2013). "Film Review: 'The Book Thief'". Variety. Retrieved February 23, 2014. ^ Merry, Stephanie (November 14, 2013). "'Book Thief' movie review". The Washington Post. Retrieved February 23, 2014. ^ Kemp, Stuart (December 13, 2013). "'American Hustle' Dominates Australian Academy's International Award Noms". The Hollywood Reporter. Prometheus Global Media. Retrieved January 1, 2014. ^ "Nominees for the 86th Academy Awards". Academy of Motion Picture Arts and Sciences. January 16, 2014. Retrieved January 16, 2014. ^ Reynolds, Simon; Harris, Jamie (January 8, 2014). "BAFTA Film Awards 2014 – nominations in full". Digital Spy. Retrieved January 8, 2014. ^ "Golden Globes Nominations: The Full List". Variety. January 11, 2014. Retrieved March 10, 2014. ^ "35th Annual Young Artist Awards". Young Artist Awards. Retrieved April 14, 2014. Wikimedia Commons has media related to The Book Thief (film).